On a week when being outdoors is hazardous, history can substitute for fresh air. 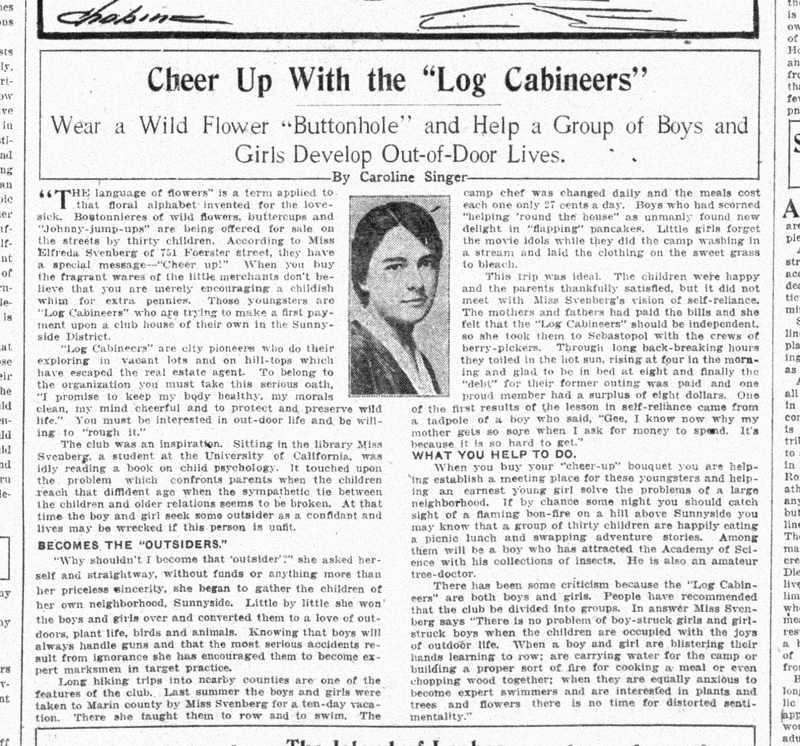 Here is a story from a century ago, about a group of Sunnyside children called the Log Cabineers, who were led in many activities around the then-undeveloped hills in the neighborhood by a remarkable young woman, Elfreda Svenberg of Foerster Street. She introduced them to the joys of being outside with plants and animals, taking them on hiking trips–even a ten-day vacation in Marin. SF Examiner, 20 Mar 1917. View larger. Newspapers.com. Miss Svenberg included both boys and girls in her club, saying they were “too occupied with the joys of outdoor life” to become boy-struck or girl-struck. Rowing a boat, hiking among the wildflowers, eating a picnic lunch outside–it all sounds rather wonderful right now, while San Francisco is engulfed in toxic smoke. Perhaps Elfreda and her Log Cabineers had some luck with their fund-raising, because later that year, this notice appeared in the SF Chronicle. I have yet to find exactly where this was located. SF Chronicle, 15 Dec 1917. SFPL Chronicle Archive.